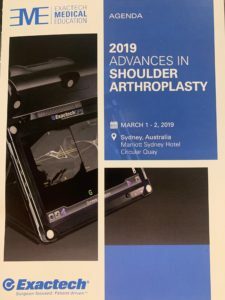 Exactech hosted the 2019 Advances in Shoulder Arthroplasty meeting in Sydney, Australia. Dr Joseph D Zuckerman, a past president of the American Academy of Orthopaedic Surgeons, was the course chairman. Dr Macgroarty was invited by Dr Zuckerman to be on faculty, delivering a presentation and contributing to panel discussions on complex shoulder arthroplasty decision making processes. 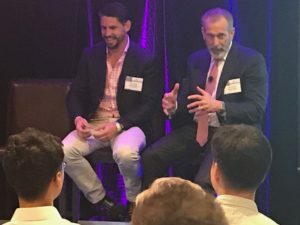 Dr Macgroarty and Dr Zuckerman answering questions during a panel discussion during the 2019 Advances in Shoulder Arthroplasty meeting. 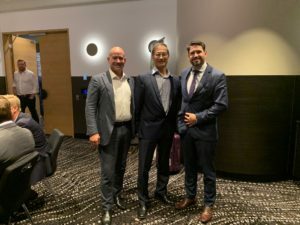 Dr Macgroarty, as President of the Queensland Shoulder Society, hosted Professor Allan Wang, Perth Orthopaedic Shoulder Surgeon, as the keynote speaker for the February 2019 Summer meeting. Professor Wang spoke about his learning curve using the Exactech GPS navigated TSA system. He also delivered his paper titled: “The SESA Rotator Cuff Survey : Developing a Rational Approach to Surgery”. A number of difficult case studies were also presented for a panel discussion with Dr Phillip Duke, Dr Steve Andrews and Dr Ezekial Tan. QSS President Dr Kelly Macgroarty, along with QSS Secretary, Dr Ken Cutbush welcomes Dr Allan Wang from Perth as their guest speaker at the QSS Summer meeting. He was also asked to perform a live surgical demonstration of his technique of Superior Capsular Reconstruction for irreparable massive cuff tears. 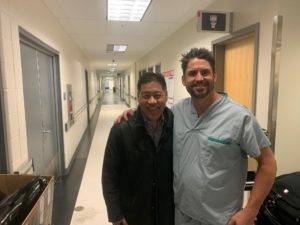 Following the meeting, Dr Macgroarty spent time with his colleague and friend, Dr Ian Lo from Calgary. 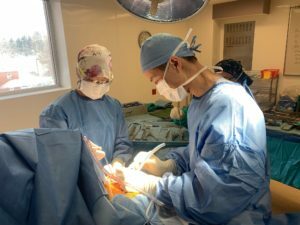 Dr Macgroarty observed Dr Lo perform a revision cuff repair with patch augmentation and also a Laterjet procedure. Dr Lo trained under world renowned US surgeon Dr Stephen Burkart who championed this technique with Dr Joe DeBeer from South Africa. 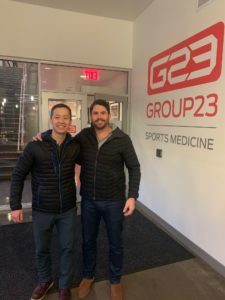 Dr Macgroarty visited with Dr Ian Lo following the meeting and observed his Sports Medicine Clinic in Calgary. 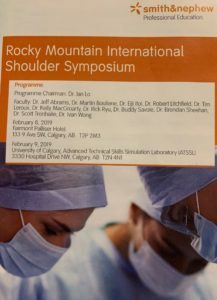 In September 2018, Dr Macgroarty was invited back as the only Australian surgeon, to be on faculty at this International Shoulder Meeting. 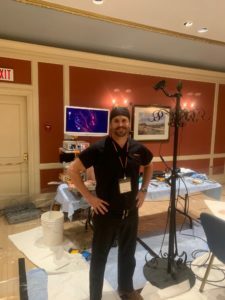 Alongside world renowned shoulder surgeon, Professor Felix “Buddy” Savoie, Dr Macgroarty gave a series of lectures and facilitated cadaveric labs demonstrating his latest techniques in shoulder surgery. 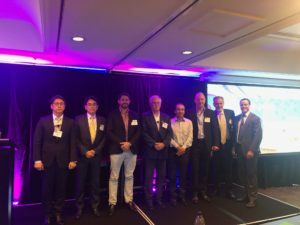 The meeting was attended by many North American and International surgeons, which allowed for the sharing of ideas and new concepts in shoulder surgery. 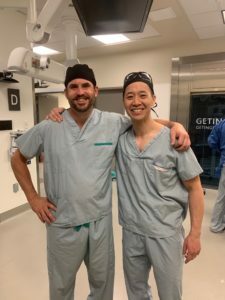 In June 2018, Dr Macgroarty was invited to co-chair an International Shoulder Course in Singapore. Alongside his good friend and colleague, Professor Ian Lo from Calgary, Canada, he gave a series of lectures and facilitated in cadaver labs for surgeons from all over South East Asia. Dr Macgroarty was recently elected as the President of the Queensland Shoulder Society at the Winter meeting in 2015. He takes over from outgoing President Dr Mark Ross. Previously, Dr Macgroarty has served as the Secretary and Treasurer of the Society. The new Secretary and Treasurer is Dr Ken Cutbush. Dr Macgroarty on faculty at recent national shoulder symposium. 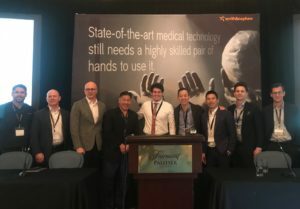 Dr Macgroarty was recently invited to be on faculty at the Smith and Nephew A3 Shoulder Symposium. 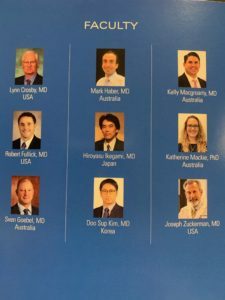 Other members on faculty included several renowned shoulder surgeons from around Australia as well as Dr Jeff Abrams, the current president of the American Shoulder and Elbow Society. Dr Des Bokor who was chairman for the conference invited Dr Macgroarty to speak about his experience with adolescent athletes with shoulder instability. 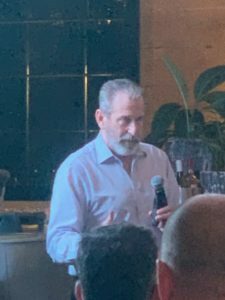 In addition Dr Macgroarty spoke about his techniques for arthroscopic rotator cuff repair and surgical options available when massive cuff tears are not repairable. The meeting was well attended by well over 60 delegates with great discussion about all recent and controversial shoulder topics. Dr Macgroarty recently attended the 2 day Arthrex Mega Shoulder Conference in Melbourne held on 30-31 August 2013. Dr Stephen Burkhart from San Antonio Texas USA and Dr Bradford Parsons from New York City were guest speakers. 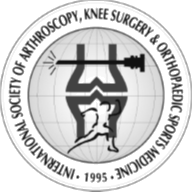 Latest techniques and controversies in arthroscopic shoulder surgery were discussed over the two days with an excellent local faculty. Following the course, Dr Macgroarty, Dr John McGuire of Townsville and Dr Brad Parsons continued to discuss all aspects of shoulder surgery while visiting some of Melbourne’s fantastic tourist locations. Dr Macgroarty was delighted to participate in the recent Physiotherapy Education evening hosted by Brisbane Knee and Sports Surgery at St Andrew’s hospital. Dr Macgroarty presented his case series of patients undertaking arthroscopic reconstruction of the AC joint using the LARS ligament. Early follow up has been promising with no failures to date. Further assessment is required to confirm long term results of the technique.